Versatech Inc. has taken delivery of and installed a NEW 2012 HAAS VF7/50 CNC Vertical Machining Center. Visit our News page for pics and details. Photo Gallery Online. View our Facilities, Equipment, and Part samples with our online photo gallery. No wiggle room in your schedule? Need precision manufacturing other Job Shops just can't match? At Versatech, there are no limits to quality. ISO 9000-2001 and ISO 14000 compliant. Visit our Services page to learn more. Custom manufacturer of precision components and assemblies, including milling, drilling, turning, and welding operations. LEAN manufacturing, modern CNC machining, welding robots, part sizes to 48" X 72": Versatech stands apart. Learn more on our Capabilities page. 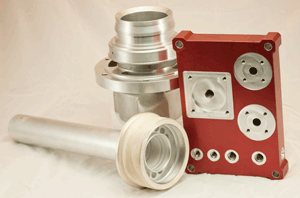 CNC lathe and machining center operators to work at a state of the art precision parts manufacturer. Applicants will be performing tasks such as machine operation and setup, inspection, packaging, and simple fixture design. Ability to interpret and design part fixturing, on screen programming and program editing, and an understanding of MasterCam are a plus. Wages are based on experience and skills. Health and retirement benefits are offered. Meeting the challenges of 21st century precision machining. 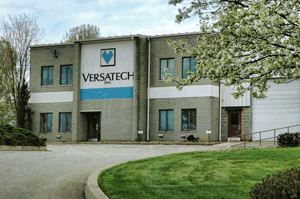 Our state-of-the-art facility and highly trained machinists set Versatech apart from many job shop competitors. Our promise of precision machined parts "In Tolerance, On Time" is at the heart of everything we do. Contact us today and find out how Versatech takes the risk out of contract manufacturing. For over three decades, Versatech has built a reputation for stepping up to most demanding challenges. Whether your order is routine but tight-tolerance or requires complex machined weldments and CNC four-axis turning, Versatech delivers. Complete our Custom Quote form today. We'll get back to you quickly, developing a firm quote you can rely on. Located in Western PA's Laurel Highlands, Versatech serves a variety of industries throughout Pennsylvania, the Pittsburgh region, and beyond.